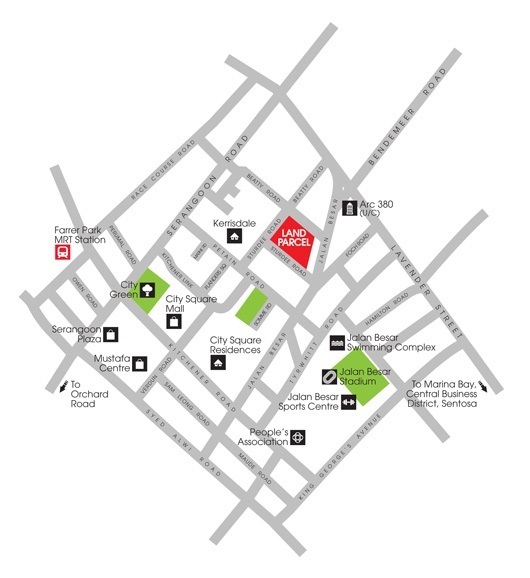 Located at the fringe of the city, the site is a short drive to Orchard Road, Singapore’s premier shopping street. Future residents will also enjoy close proximity to the Central Business District, Marina Bay and Sentosa. Farrer Park MRT Station is within walking distance. A wide range of shopping, dining and entertainment options are available at the nearby City Square Mall and Mustafa Centre. Residents can also engage in sports and recreation activities at the nearby Jalan Besar Sports Complex. SINGAPORE — A tender for a residential site in the vicinity of Farrer Park has attracted strong interest from developers. The top bid of S$181.2 million from SL Capital 1 surpassed market expectations, reflecting its confidence that home buyers will be drawn to the attractive location. The 65,784sqf site on Sturdee Road, located within Rest of Central Region (RCR) or the city fringes, was released last month from the Confirmed List of the Government Land Sales (GLS) Programme for the first half of the year. The 99-year leasehold site has a maximum gross floor area (GFA) of around 230,251 sq ft and can yield an estimated 265 private homes. The top bid translates to about S$786.92 per sqf per plot ratio (psf ppr), as the unit of developer Sustained Land set itself apart from the other 15 bids, showed data from the Urban Redevelopment Authority at the close of tender yesterday. SL Capital 1’s bid was 7.3 per cent higher than the second best one of S$733.11 psf ppr from Singland Homes. Both bids were well above the top end of market expectations of about S$700 psf ppr. Mr Nicholas Mak, executive director of research and consultancy at SLP International Property Consultants, said developers were drawn to the location of the site, which is within a comfortable walking distance to Farrer Park MRT and City Square Mall. “Furthermore, this site could yield about 270 units, which is relatively small in number, resulting in a lower amount of funds needed to develop it. Hence, the risk would also be lower and it would be attractive to a wider range of developers,” he said. He noted that the Sturdee Road site is the smallest in terms of land area and maximum allowable GFA among the six residential land parcels in the Confirmed List of the GLS programme. Ms Christine Li, director of research at property firm Cushman & Wakefield, said the site “appeals to smaller developers who had previously been priced out of GLS tenders. We seldom see a site with a total quantum below S$200 million”. As the number of homes to be developed on the site is not large, it will be easier for the market to digest. This means the developer shoulders less risk of not being able to sell within five years, which will attract additional buyer stamp duties, she added. “Compared to the Jurong West Street 41 land tender that closed two weeks ago and attracted nine bids with the top bid of S$630 psf ppr, the higher participation rate for the tender for Sturdee Road shows that many developers are still looking to acquire attractive sites, especially if the residential projects yield fewer than 400 units,” Mr Mak said. He added that the price gap between the top and second-highest bids had been quite typical for GLS residential tenders in the past 12 months. However, other than the top four bids of S$160 million and above, the rest of the bids were rather cautious, he noted. He estimated the break-even price for the new condominium to be developed on this site at between S$1,260 psf and S$1,310 psf. Register for the latest information on Sturdee Residence by filling up your details below!